The Sargasso Sea is a fundamentally important part of the world's ocean, located within the North Atlantic sub-tropical gyre with its boundaries defined by the surrounding currents. It is the only sea without land boundaries with water depths ranging from the surface coral reefs of Bermuda to abyssal plains at 4500 m. The Sargasso Sea's importance derives from the interdependent mix of its physical structure and properties, its ecosystems, its role in global scale ocean and earth system processes, its socio-economic and cultural values, and its role in global scientific research. Despite this, the Sargasso Sea is threatened by a range of human activities that either directly adversely impact it or have the potential to do so. Being Open Ocean, the Sargasso Sea is part of the High Seas, the area of ocean that covers nearly 50%of the earth's surface but which is beyond the jurisdiction and responsibility of any national government, and as such it enjoys little protection. To promote the importance of the Sargasso Sea, the Sargasso Sea Alliance was created under the leadership of the Government of Bermudian 2010. 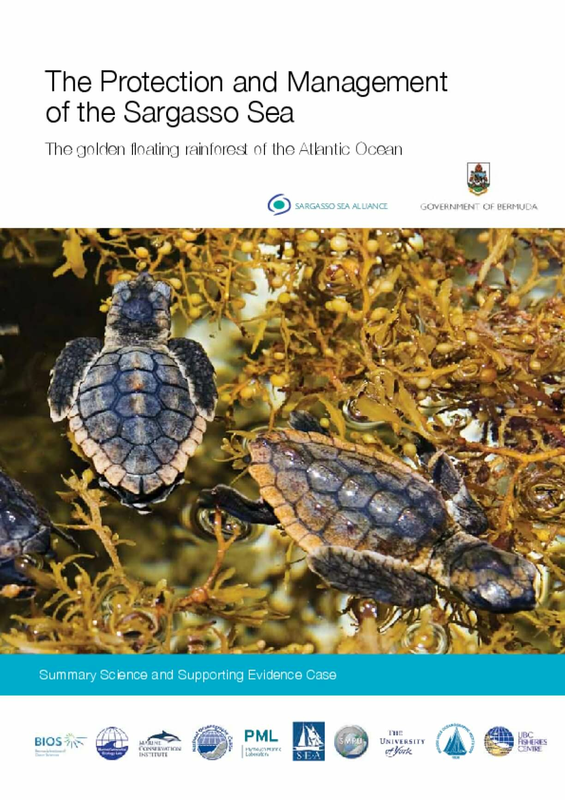 This report provides a summary of the scientific and other supporting evidence for the importance of the Sargasso Sea and is intended to develop international recognition of this; to start the process of establishing appropriate management and precautionary regimes within existing agreements; and to stimulate a wider debate on appropriate management and protection for the High Seas. Nine reasons why the Sargasso Sea is important are described and discussed. It is a place of legend with a rich history of great importance to Bermuda; it has an iconic ecosystem based upon floating Sargassum, the world's only holopelagic seaweed, hosting a rich and diverse community including ten endemic species; it provides essential habitat for nurturing a wide diversity of species many of which are endangered or threatened; it is the only breeding location for the threatened European and American eels; it lies within a large ocean gyre which concentrates pollutants and which has a variety of oceanographic processes that impact its productivity and species diversity; it plays a disproportionately large role in global ocean processes of carbon sequestration; it is of major importance for global scientific research and monitoring and is home to the world's longest ocean time series of measurements; it has significant values to local and world-wide economies; and it is threatened by activities including over-fishing, pollution, shipping, and Sargassum harvesting. Apart from over-fishing many of the threats are potential, with few direct causal relationships between specific activities and adverse impacts. But there is accumulative evidence that the Sargasso Sea is being adversely impacted by human activities, and with the possibility of new uses for Sargassum in the future, the lack of direct scientific evidence does not preclude international action through the established precautionary approach. The opportunity to recognize the importance of the Sargasso Sea and to develop and implement procedures to protect this iconic region and the wider High Seas should be taken before it is too late. Copyright 2017 by Sargasso Sea Alliance. All rights reserved.